The leech heartbeat central pattern generator (CPG) consists of a network of heart interneurons (HN) that coordinate heart excitor (HE) motor neuron activity via inhibitory chemical synapses. Each segmental pair of HE’s is connected to one another via electrical coupling. Depending on the segment, the pair of motor neurons in the living system is active across a wide range of phase differences from nearly in-phase to anti-phase . Prior efforts to model this complete network have not quantitatively matched the intersegmental phase differences observed . We have created a reduced network model in Simulink to explore parameters that contribute to these phase differences. In our network model, we implemented known neuronal properties and synaptic connections from a single segmental ganglion as shown in Figure 1. In our initial model run, the HN’s were modeled as endogenous bursters as previously described ; the HE’s were modeled as tonic firers. We varied three parameters in this study: phased delay of the right HN synaptic input (Φ Syn ) and the maximum conductances of the inhibitory synapse (g Syn ) and electrical coupling (g coup ). Leech heartbeat circuit diagram showing identified heart interneurons (HN) of the CPG and their pattern of inhibitory synaptic connections (lines with circles) onto each other and the heart excitor motor neurons (HE). The resistor symbol indicates rectifying electrical coupling connecting two HE neurons in the same segment. 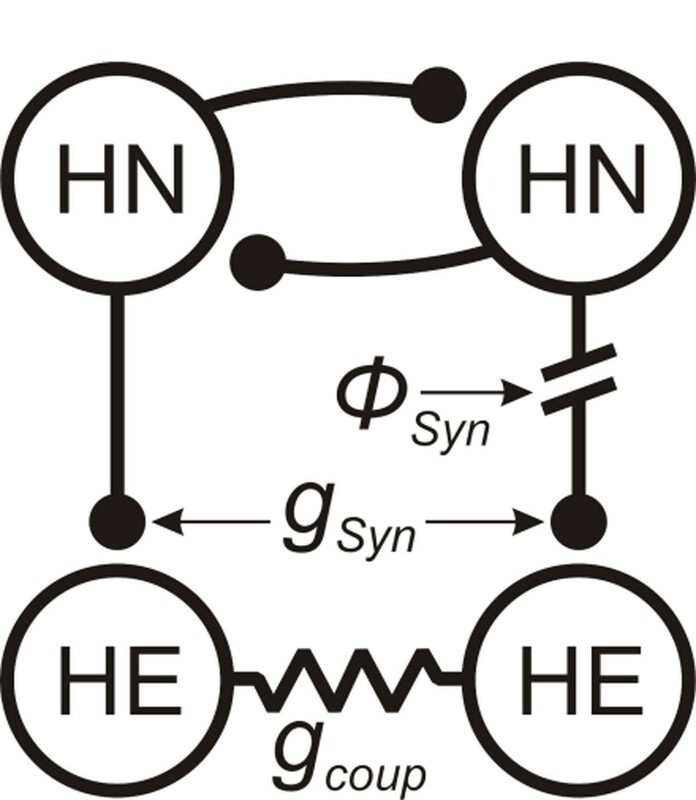 Three parameters were varied in this study: the phase of the right HN synaptic input (Φ Syn ) and the maximum conductances of the inhibitory synapse (g Syn ) and electrical coupling (g coup ). We found that in this network g Syn must be at least 150 times greater than g coup in order to obtain 1:1 entrainment of the HE’s with the HN’s. Under conditions with zero Φ Syn , increased g coup led to increased instantaneous spike frequencies (ISF) and reduced duty cycle, primarily due to a delayed burst beginning. Increasing g Syn alone with zero Φ Syn led to little change in HE phase or duty cycle, but saw increased ISF. With relatively high levels of g Syn (300-600 nS), increasing Φ Syn (0.2-0.5) caused one HE to decrease its duty cycle while the other increased. Higher levels of Φ Syn (0.5-0.8) caused the HE’s to switch their relative duty cycle patterns. With weak g coup (0.25-0.50 nS) and moderate Φ Syn (0.4-0.6), increasing g Syn led to a reduced HE duty cycle and side-to-side phase difference. The largest phase differences were found when both g Syn and g coup were relatively strong. In summary, increases in g coup tended to lead to increased phase differences, while increases in g Syn led to decreased phase differences. Our search of parameter space has provided a foundation for understanding the mechanisms underlying variable phase differences in neuronal networks and reinforced the importance of compromise between synaptic and neuronal properties for producing functional motor patterns. We would like to thank Gennady Cymbalyuk, Ronald Calabrese, and Paul S. García for model input and support. The project described was supported by the Vermont Genetics Network through Grant P20 RR16462 from the INBRE Program of the NCRR (NIH).